Kids love Santa Claus! On a cozy weekend afternoon, you can craft up Kris Kringle with one these festive and fun Santa crafts for kids. From ornaments to salt dough, your little elves will be busy making all season long. 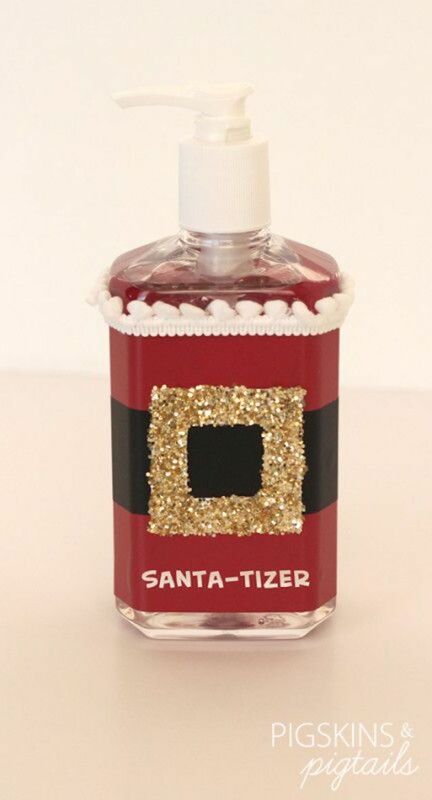 Keep the germs away this flu season with a cute bottle of Santa-tizer. We all know the holidays are fun, but when everyone's cooped up inside the same house, it's important to remember to keep your family healthy. Hygiene and the holidays go hand in hand! Handprint art is such a great way to make keepsakes that your family will look at fondly for years to come. This cute Santa handprint ornament uses just salt dough and some paint in order to create a cute ornament for your family Christmas tree. Better yet, make one every year and watch your little ones grow. This is a great craft for preschool-aged kids who are just learning about shapes. Make education festive by crafting cute and silly paper Santa faces out of squares, triangles, and circles. Maybe even get advanced with trapezoids and stars! This little Santa craft is simply adorable. Use old socks with holes in them to make this sweet little no-sew Santa doll. Using different colors and patterns to make a whole collection is also a great idea. Line them up on the mantle when you're finished for a cute decoration. This is a perfect holiday ornament. The wood slice is a rustic touch as well as a great scent diffuser if you use balsam or fir wood. Hang them on the tree or around the house throughout December. Popsicle sticks are the easiest way to craft. Make this easy popsicle stick Santa with just some googly eyes, fluff, and felt. If you're a crafting family, you're sure to have at least one box of these lying around at any given time. Christmas crafts don't need to be an indoors-only situation. This terra cotta pot Santa Claus is perfect, especially if you live in warm climates where you might not be having such a white Christmas. Set him up on the stoop or garden wall to bring holiday cheer to your front yard. Wait and watch for Santa Claus this Christmas with this custom pair of Santa binoculars. Your kids will love making this special craft in hopes of spotting the man himself on Christmas eve. Just make sure they don't stay up all night! This wacky craft has a creative take on Santa's beard. Popsicle sticks and yarn make for an abstract Christmas craft. Who said festive can't also be funky? Isn't this pom pom Santa just the cutest? We love how easy this craft is to make, as well as how adorable the product turns out. Make one or two or three, or a whole army of little pom pom Santas with your kids in preparation for the "real" Santa Claus's arrival on Christmas night. Here's another great Santa-themed popsicle stick craft. Make use of extra buttons lying around and some holiday-colored pipe cleaners to make little Santa friends and even elves with this tutorial from The Resourceful Mama. Head over heels and upside down for Christmas? This is the craft for you—an adorable toilet paper roll chimney. Add humor to your house by helping your kids make this Santa-stuck-in-the-chimney craft to leave out with the cookies on Christmas Eve. What a great way to jazz up what might otherwise be a regular drinks table at a holiday party! Add a little paper Santa face to a coke can and place decorative Christmas cupcakes on top for an all-in-one sugary party table extravaganza. Remember to limit the kids to only one or they'll be up all night! Keep it green, even when outside it's mostly gray and white, with a recycle-themed Santa craft like this one. Use newspaper, magazine clippings, or excess wrapping paper to make your own environment-conscious Santa Claus face to hang around the house. For hours of play at a low cost, make these Santa and Reindeer craft stick puppets with just a few key crafting materials. Tell the story of Rudolph the Red-Nosed Reindeer or make up your own funny Christmas tales around the fire on a cold winter night.